I can’t wait for spring, how about everyone else. The cold and snow, it’s time to go away but I know that won’t happen. It’s only February. We had a scare with Peanut. She went for a vet visit to get her nails trimmed and glands taken care of and John found a small lump. The vet felt it was important to take a biopsy since it was on her leg. Thank God, yesterday we found out it is a fatty cyst. We couldn’t imagine anything happening to either one of our pups. They are almost 5 and they are still so young. The usually positions for tons of belly rubs, which are received daily, LOL!! 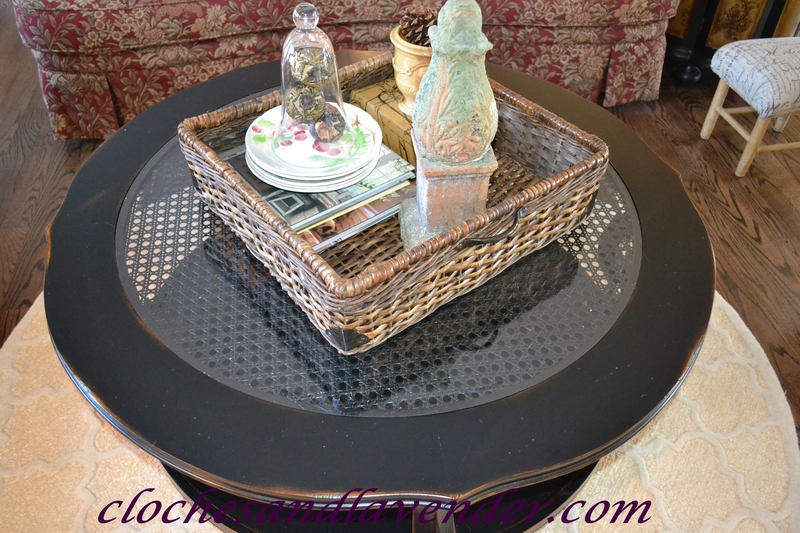 I wanted to share the way our coffee table in the family room is looking these day. I filled it with decorating books and some antique dishes my grandmother bought my mom years ago. I have always loved these dishes and take special care with these. I love my cloches and placed one filled with these intricate carved balls I purchased many moons ago. I wanted to finish this off with a terracotta finial from Ballard and a small French pot with a simple pine cone. Stay tuned for a story with this basket and Reeses. He is my little investigator. Will be posted very soon. I’m starting to get ideas for spring projects, how about you?? Everyone stay warm and hope the Spring Gods show up early. So glad to hear peanut is ok! That must have been quite a scare :(. It is super cold in florida, but nothing like what’s happening at home. Stay warm, and keep giving those belly rubs! It was scary but I thought she’d be fine. She was still full of piss and vinegar, but you never know. Love the vignette Cindy. So pretty. So happy little peanut is doing good and it was nothing too serious. Those two are just too adorable. Love their little faces. Your vignette looks really good. So glad that Peanut is okay. Watch the little fatty cyst . My dog had one and the vet said no problem, but it got to big all of a sudden and she had to have surgery to have it removed. . It was as big as a tennis ball. 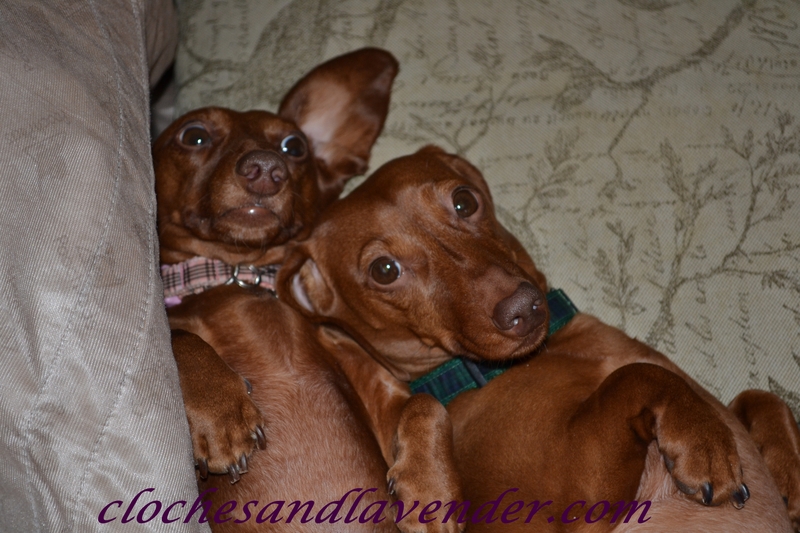 They are sure cute fur babies. They are like children, aren’t they? Stay warm – it’s going to be 75 here to day in Sunny CA. Have tomatoes to plant. Hi Cindy, So happy that Peanut is okay. I know those fatty cysts are a scare to find. Our minds think the worst. We went through this with two of our Golden’s too. Love your black table vignette. Nice transition to spring. Yes, we are ready here too and I have lots of ideas going through my head for warmer weather. Thanks so much Celeste. I love them too much. I can’t help it. I’m so glad your little Peanut is ok…it’s always scary when something is wrong with our fur babies. 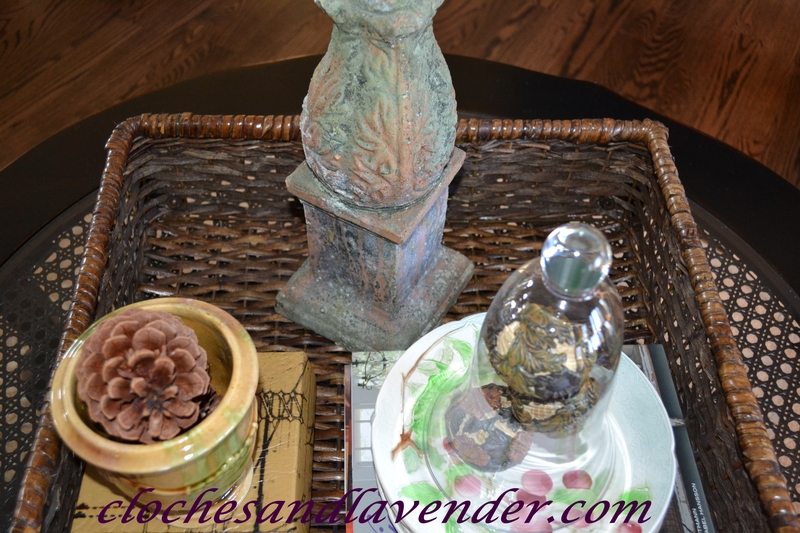 Love the vignette you created and I love your coffee table too! I’m so glad your news was positive and your little doggie is fine. On the watch for spring here too, daffodils blooming. Your table is a great start to spring, I love the antique dishes from your grandmother on the tray. Stay warm…………. Glad to hear that lump turned out to be nothing serious, Cindy. Your coffee table vignette looks lovely. Hopefully, Spring will be here soon. I am eager to get some Spring decorating going here. Your vignette is so pretty Cindy! I love cloches too and your vintage plates look lovely. Glad the puppy was o.k.! Our Mo has a few of those fatty cysts, like the fat goes right to one spot. I guess I have one too….it’s called my rear end.